Browse the latest Michaels Weekly Ad for special offers of arts, crafts, framing, floral, wall décor, and DIY products. Moreover, a greater number of categories are available in the range of this retailer. You can find regular ads on this page. Subscribe to get emails and notifications. This store is a competitive one as opposed to Hobby Lobby and similar stores. Find Easter, Christmas, St. Patrick’s day and more special day deals of the Michaels Ad. They have also promo codes for savings. Not only ads are the sources of the deals. Improve your crafting skills and art with high-quality materials. Wedding, storage, kids’ products, art supplies, baking supplies, crafts & hobbies, floral sale, frames, papercraft, and many more categories are in the retail cycle of the Michaels. It’s a retailer with 1250 stores in 49 states. Michaels offers huge discounts on so many products this week. 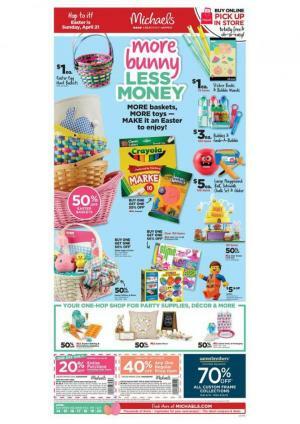 Save with the coupons that are viewable on the Michaels Weekly Ad Mar 29 - Apr 6. 50% off with promo code: 50SAVE33119 until April 6th. Over 50% price drops are available on the first page. Their claim is that these are the lowest prices of the season. Among the items, floral stems, wrapped canvas, photo boxes, custom frame collection, and more products are available in the Ad. Earn Michaels Bucks with your purchases. Save 70% off your purchase of gallery wrapped canvas. 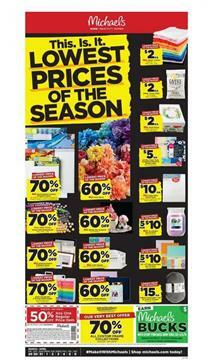 Michaels Weekly Ad online sales can be really helpful for you to save on these decorative items. As you walk through the content of this sale, you will realize that many half-price deals are also available for wreaths, garden collection trees, and more. Categories of products like baking, party supplies, art supplies, photo or art frames, and more are featured in the latest ad content. Subscribe to get the newsletter in your inbox. Follow our Facebook page to get emails.